This post has been a long time coming, but other things have taken much higher priority as I've settled into life in Santiago. It's been an exceptionally busy week for work and getting started on Spanish, but I enjoy this rather non-stop method of getting things done, so I´m currently quite content. I wanted to write about one particular part of my trip which I took before coming here, before the memories faded completely. In my two weeks traveling in Southern China before I left to come to Spain I spent three days in an area of Northern Sichuan called Jiuzhaigou. This is often said to be the most beautiful place in China, and although you will hear this about countless other areas, it is without a doubt truly stunning. However, the fact that it is truly stunning makes it a tourist hell hole and, if you follow along with the crowd you're journey is likely to be marred by the fact that there are thousands of others jostling to marvel at the serene beauty of this natural wilderness. Not my idea of fun! 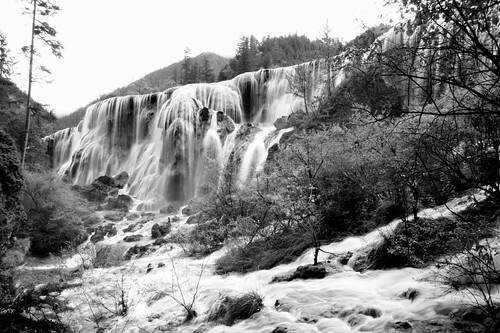 Somehow, more through luck than judgment I seemed to get Jiuzhaigou right and so I would recommend the journey that I took, if you are able to. 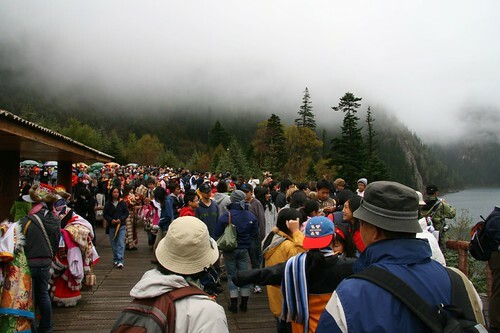 Jiuzhaigou would not be easy without any Chinese. The hotel which I found at 9 in the evening on my arrival had no English speakers and I only spoke to a single person in the park who could speak more than a couple of phrases. That said, it´s always possible to stumble your way through, and I would suggest trying to do so, rather than coming on a package tour, the method that 99% of people opt for, as it is without a doubt much easier. 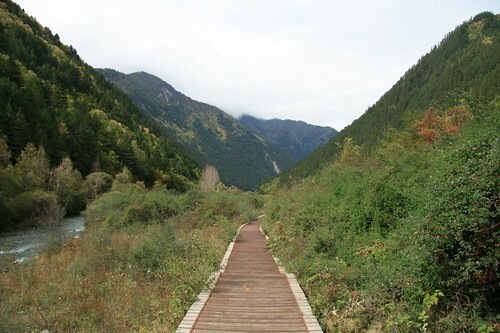 Jiuzhaigou nature reserve is made up of two valleys which come together in a Y-shape. The entrance to the site is at the bottom, at somewhere around 2500 meters above sea level. The top is closer to 4000 meters and the length of the valley is around 30 km (from the top of the Y to the bottom). Along the two branches run rivers of crystal clear water, through forests, opening into magnificent lakes, surrounded by mountains with spectacular waterfalls every few km along the river´s length. The very top of the right fork of the Y is an ancient forest, with a floor padded in thick moss, which you can look at, but can´t walk in. Along the length of the park is not only a series of rivers and waterfalls, but also a winding road, upon which the park's buses run constantly through the day, ferrying tourists from one spectacular spot to another. As I got to the entrance and saw that this was the way to get around the park, my heart sank. The last thing I wanted to do was to spend a day in a paradise going from breathtaking points A to B with 50 other people on a crowded bus. I generally prefer to turn up to a place with knowledge only of the basics and stumble around for a while finding out for myself how things work. For this reason I never booked any hotels in advance before my trip, but always turned up in a city, found a local restaurant or tea house and then worked out where was best to go - this worked well for me throughout the trip. 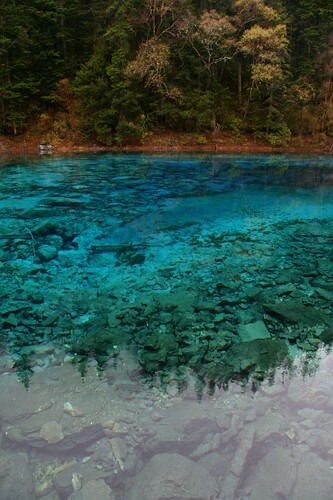 Consequently my knowledge of how the system worked in Jiuzhaigou wasn't up to much. On the advice of my hotel, I turned up at the entrance very early (a little before 6.30 am) to get my two day ticket, which allows entrance to the park on two consecutive. Officially you are not allowed to stay in the park over night, but there are guest houses in some of the villages which pepper the lower areas of the valley. By 6.45am I was on one of the coaches, not really knowing how this was going to play out and we started making our way up the valley. 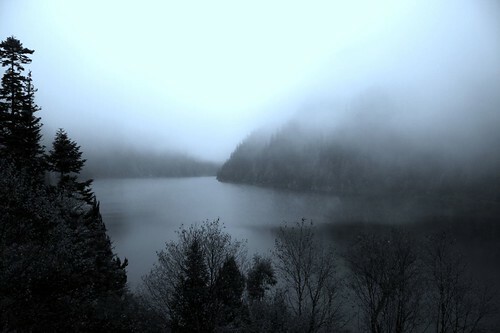 After 15 minutes or so we got to the first lake and everybody trudged off the coach, taking snaps in the early morning mist. The couch disappeared and we were left to wander around the little area by the road side, shivering in the rather chill air. A few minutes later another coach arrived with another load of people who disembarked and we took their place, to go up to the next scenic spot. As we drove up I could see the footpath, a sort of board walk, some way away from the road, which appeared to be going even more directly up the valley, next to the river, than we were. This was clearly the way to be doing it. Not knowing how it was going to work, I stayed on the coach at the next stop, as everyone else got out to take more photos. I stayed on the bus for another 45 minutes or so as we continued to climb and more people got on and off. Eventually we made it to the top by which point there were perhaps 5 people on the bus. The trip to the primeval forest at the top was by footpath only, which took perhaps another 15 minutes. I strolled ahead and within four or five minutes I was suddenly, completely alone! 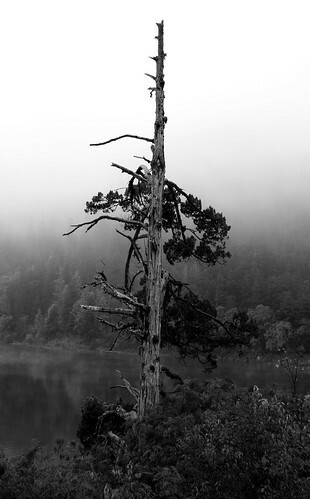 The mist was still thick and the forest was just waking up. The air was thin at this altitude and I struggled for breath, but knew that this was exactly what I´d come for: the absolute tranquility of being away from it all! Getting to the top, I spent some time looking around at the ancient forest feeling for the first time in a long time, in complete peace. I miss Beijing very much (though Santiago is wonderful) but peace is something that you get very rarely when you´re there! Soon the other hikers arrived and the peace was broken, so I started back down. Getting back to the top most coach stop it seemed that others were getting back on the coach to go back down, but I saw the planked foot path and took that option instead. Again, I was completely alone, walking beside the stream which at this point in the valley was little more than a trickle. I walked reasonably quickly but not so quick that I couldn't take in what was around me, and stop for the occasional photo. It must have been about four hours until I saw another person, as everyone else sat, packed into the coaches winding up and down the tarmacked road. As I descended to the area where the lakes started I could see the opposite side of each one, packed with tour groups and coaches as they jostled to get the best position for photos. More and more people joined the footpath as I got lower, but it was rarely crowded with more than a few hikers. I had a vague idea of how long the path was but in the end it took me around nine hours of pretty constant walking to cover the 25 km, not even down to the bottom, but to the lower most spots of particular beauty. The day was spectacular. The lakes and waterfalls are truly magnificent and I was extremely happy to have found a way to see the park without following the usual trail. The sky was constantly overcast and I missed the snows by a day, but nonetheless it was possible to get a few nice shots. Searching through the hundreds of photos afterwards I realised that I find it particularly hard to get striking shots of places which are already very beautiful. The second day I got to the park early again, and took the coach up the left arm of the Y. This time I did take the coaches a few times because I wanted to see several areas in different lights and with the time available, I wouldn't have been able to do so on foot. My enormous blisters from the first day were also not helping matters but I hiked for a good 15 km the second day to see more of the incredible scenery. 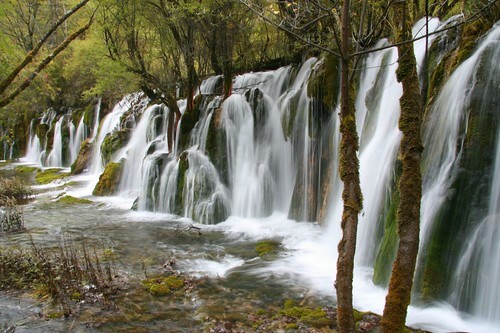 Anyway, the moral of the story is that you should definitely pay Jiuzhaigou a visit if you´re anywhere nearby, don´t be too put off by the crowds and dive off the road and onto the footpaths at the top of the site, in order to walk back down. Be warned of course that it´s quite some way and I take no responsibility for those who take the above advice and get into trouble. The town attached to the park, is a not particularly pleasant area, heaving with hotels, guest houses and trinket shops, catering to the tens of thousands who descend on it every day. The food in the restaurants is fairly basic, but the yak meat stews are really very good. 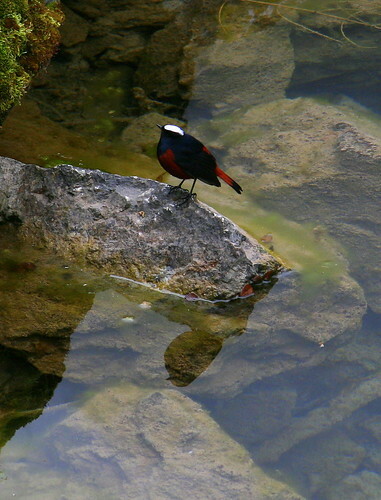 Anyway, that's my roundup of Jiuzhaigou but below are some of the photos I got from the two days walking. The footpaths are also not terribly picturesque, but are probably the best option for this area which is regularly very rainy.